Set against stunning panoramic views of the surrounding countryside, Acquaviva Agritourism is the ideal place to spend your holidays, tucked away in the tranquil Umbrian countryside and just a few kilometres from the centre of Todi and other important places of interest in Umbria. 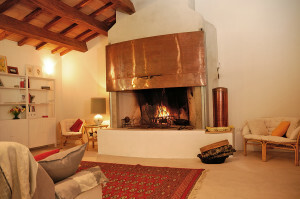 Visitors may read or relax in our common living area, complete with a large fireplace. 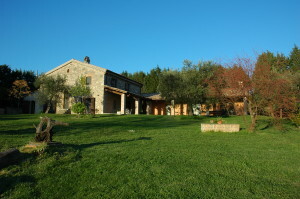 The pool and bocce court are surrounded by olive groves and offer magnificent views of the nearby hills. They are easy to reach, even for those who may have difficulty getting around. A common barbeque is available for use in our large garden. We have a private car park, for the exclusive use of our guests. Free wireless internet connection is available in the common area and a wired connection is available in the rooms. All of the facilities have been designed to accommodate customers with special needs as well, so as to make the rural areas accessible to everybody. Visitors can get a bit of fresh air permeated by the scents of nature on peaceful, relaxing walks through the forested surroundings, which are also rich in history. It is not uncommon to spot wild animals as well. Acquaviva Agritourism is located along an ancient route, which is currently part of the Circuiti del Paesaggio (a series of itineraries leading visitors through the local landscape), inside Todi county. This route may be explored on foot as well as by mountain bike and on horseback. From Acquaviva, the Martani Trekking trail system may also be reached, along with many other sports facilities. Acquaviva Agritourism is undoubtedly an excellent starting point for day trips. In addition to Todi, it is also easy to reach Perugia, Lake Trasimeno, Assisi, Orvieto, Spoleto, Montefalco, Marmore Falls and even Rome and Florence.